O-bento—the meticulously prepared meals arrayed in compartmentalized boxes—were conceived as elaborate feasts-to-go for the traveling aristocrats of Kyoto’s Imperial Court. Today in Japan, simpler versions can be found just about everywhere—supermarkets, baseball games, even railroad stations; train travelers wait to reach a certain prefecture before buying their regional favorite. Here in L.A., imaginative restaurateurs have been captivated by the bento concept and are using it to serve everything from sushi to dessert. Well priced and bountiful, the $8.95 bento at this bright new shop includes a California roll, a small salad, tempura thoughtfully bagged in paper to preserve crispness, rice, and—inexplicably—a dinner roll. For the entrée, choose one of 20 options that include salmon teriyaki, nigiri sushi, baby back ribs, spicy grilled pork, and tofu steak. For more delicate appetites, there’s a mini bento. » 1000 Torrance Blvd., Ste. B, Redondo Beach, 310-792-5185. There’s a certain delicious logic to serving a bento dessert in a converted train station. At the restaurant Depot, a frame of dark chocolate holds a bed of fresh fruit and is flanked by blueberry and chocolate ice cream scoops. Crowning these goodies are a fudgy fondant, a dark chocolate mousse, and a ganache shaped like Easter eggs. It’s sure to satisfy the most devout chocoholic. » 1250 Cabrillo Ave., Torrance, 310-787-7501. In Japan, creating an especially stunning bento is considered a mark of honor for professional chefs and lunch-packing moms alike. 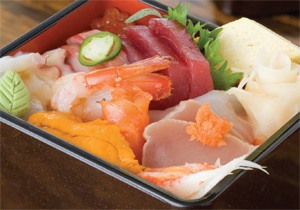 In that spirit, Kumo chef Hiro Fujita pulls out all the stops for his elegant $30 lunchtime box. The containers are designed to best suit their contents: Tempura comes in a basket, sashimi in a ceramic dish, salad in stoneware, grilled chicken meatballs in a lacquer bowl. Juicy grilled black cod and a filet mignon complete the bento, which is accompanied by nigiri sushi, rice, and miso soup. » 8360 Melrose Ave., West Hollywood, 323-651-5866. Nothing about this modest neighborhood sushi bar (no relation to the Katsu-yas) hints at the luxury tucked inside its two lunchtime chirashi sushi bento. The $18 Ultra version contains 14 fish varieties, including uni from a proprietary Santa Barbara source, scallops from the icy waters of Hokkaido, two types of fish roe, and pieces of mirugai or torigai clam . In the tri-compartment box you’ll also find a grilled giant clam kabob and sautéed beef or tofu steak, with a choice of either a seafood dumpling or one of the daily specials. Save room for dessert: green tea, black sesame, or vanilla ice cream. » 302 Rosecrans Ave., Manhattan Beach, 310-465-3761.